FULTON, NY – The Oswego County Board of Realtors recently presented Karen Merrill, coordinator of Oswego County Opportunities’ PATH program with a check in support of the programs’ efforts of helping area youth. Representatives from the Oswego County Board of Realtors present Karen Merrill, program coordinator, with a donation in support of OCO’s PATH program. From left are: President for the Oswego County Board of Realtors Bob Foster of Exit Point Realty; Merrill, Derek Woodmancy of Realty USA; Mike LaFurney of Oswego County Appraisals; and Executive Officer of the Oswego County Board of Realtors, Gene Friske. Each year the Oswego County Board of Realtors® organizes a fundraiser for the PATH program. Established in 1991, OCO’s PATH program has provided hundreds of homeless youth with transitional independent living services and helped them become contributing members of society. 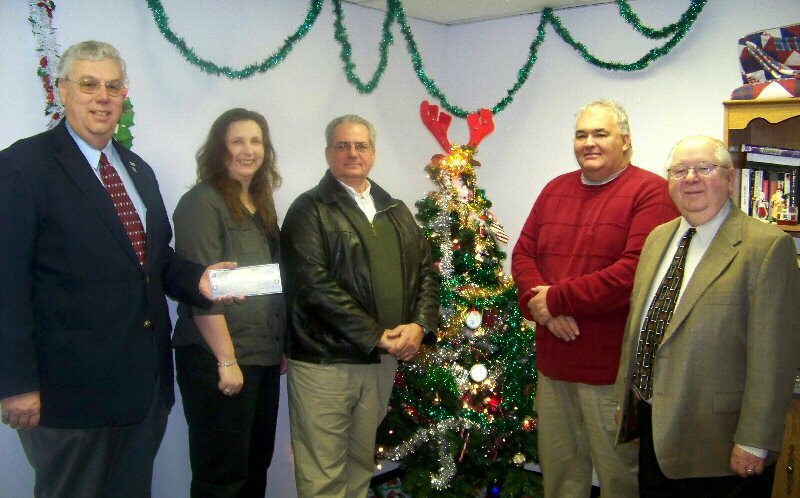 “We are very thankful for the continued support we receive from the Oswego County Board of Realtors. As we approach our 22nd year of providing services to youth in the community we greatly appreciate their generous donation and all the effort that goes into organizing the fundraiser. These donations have allowed us to secure additional funding as the number and needs of homeless youth in Oswego County increases,” said Merrill. The Oswego County Board of Realtors also provides scholarship awards at every high school in Oswego County. Their community involvement is impressive. Merrill added that she welcomes the opportunity to meet with local groups or organizations to raise their awareness of the PATH program and the positive effect it has on the youth of Oswego County. Those interested in learning more about the PATH program may contact Merrill at OCO’s Crisis & Development Services office, 315-598-6664 Ext 1708. The PATH program is funded by the United Way of Greater Oswego County, Oswego City/County Youth Bureau, NYS Office of Temporary Disability Assistance and the Department of Health and Human Services. One of Oswego County’s largest employers, OCO employs more than 650 people and boasts a volunteer force of 1200. OCO strives to improve the quality of life in Oswego County by helping people, supporting communities and changing lives.